Did you know that today is National Banana Split Day? Well it is! And just in case you feel like celebrating, I have an amazing recipe to share with you from Taste of Home: Best Loved Recipes. If you haven’t gotten your hands on this cookbook yet, don’t delay, it’s seriously amazing. We have been trying dinner ideas from it ever since we got our review copy, and all have been hits so far. I can’t wait to make this desert though, doesn’t it sound delicious? True, it’s not an actual banana split, but it’s close enough in my book! Enjoy! In a small saucepan, combine the butter, brown sugar, orange juice and cinnamon. Cook and stir over medium heat for 4-5 minutes or until sauce is smooth. Stir in bananas; heat through. Remove from the heat; stir in extract. Serve warm over ice cream. Sprinkle with coconut. Yield: 8 servings. 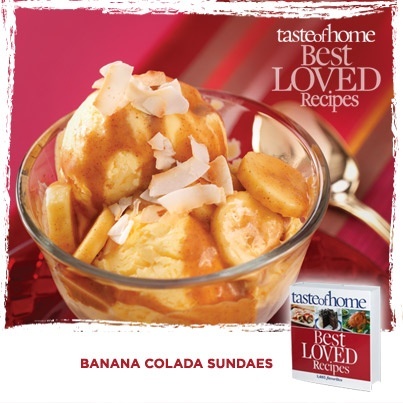 Nutrition Facts: 3/4 cup ice cream with 1/4 cup banana mixture and 1 tablespoon coconut equals 398 calories, 22 g fat (14 g saturated fat), 66 mg cholesterol, 159 mg sodium, 50 g carbohydrate, 2 g fiber, 4 g protein. For more information please visit http://www.TasteofHome.com, and follow on Facebook and Twitter. Next postThe D and D report.